Climate change is freeing the Arctic of ice -- and spurring a global competition for the natural resources stored beneath. Countries that border the sea are staking new territorial claims and oil giants are dispatching geologists. But what will the tug-of-war mean for the indigenous people and wildlife? Bo Madsen, a climate researcher, is plagued by a simple question: How heavy is the world's largest island? More importantly, Madsen wants to know how quickly its weight is changing. "This is no academic question," the Dane, a scientist at the National Space Institute and the Technical University of Denmark, yells over the whipping of the rotor blades. "The answer will determine the fate of millions of people." Greenland's majestic landscape glides by beneath the helicopter. A mottled gray-and-white glacier tongue winds its way down a series of mountain slopes. Farther up, the jagged terrain gives way to a smooth, seemingly endless expanse of white, capped by a glistening aura that makes it difficult to distinguish between the sky and the surface of the ice cap. The scientists have spent the last two hours flying over the edge of the inland ice in their Super Puma helicopter. The gigantic ice cap is close to three kilometers (1.86 miles) thick. If it were to melt, sea levels worldwide would rise by seven meters (23 feet), spelling the end for many coastal cities. "Did we load the cordless screwdriver?" the 53-year-old Madsen asks his partner, American scientist Eric Kendrick. There is tension in the air, almost as heavy as the metallic chirping of the chopper's drive shafts. How does one measure the recession of an ice cap? A lone mountain peak protrudes from the glacier ice. This is where the Danish and American geophysicists plan to set up their measuring equipment. Their project, called GNET, will be part of a formidable scientific observation network, an early warning system of measuring stations and satellites designed to monitor the Greenland ice cap. "The stations measure the height of the mountain tops once every 30 seconds," Madsen explains, "down to the nearest half a millimeter." This precision is made possible by the radio signals emitted by GPS navigation satellites orbiting the earth. The data give the scientists an indirect gauge of how fast the ice is melting, because rising land means, simply, that the weight of the ice resting on it is decreasing. The researchers have already installed two dozen of these stations all over Greenland, and they have been transmitting data for the past year. According to initial calculations, Greenland has lost 150 billion tons of ice a year in the last four years. This is five times the size of the Aletsch Glacier, the largest glacier in the Alps. GNET will provide certainty, for the first time, on one of the most important questions of global warming: How quickly is the Greenland ice cap melting? Will it take hundreds of years? Or is the ice melting faster than that? "Soon we will be able to tell mankind by how much sea levels will actually rise in the next 100 years." Climate researchers like Madsen are the chroniclers of an unprecedented change. The amplified greenhouse effect caused by the burning of fossil fuels heats the earth's atmosphere, and nowhere else in the world do the consequences become noticeable as quickly as in the still-frosty Arctic regions. Temperatures along the icy shores of the northern Arctic Ocean are rising twice as fast as in the more southerly latitudes. Computer models predict a rise in temperatures there by up to eight degrees Celsius (14 degrees Fahrenheit) by the end of the century. "We are on the front lines of climate change," says Madsen. While global warming is still a problem of the future in many places, the big thaw at the North Pole has been underway for some time. Since the mid-1970s, the white crust of sea ice covering the North Pole in the summer months has shrunk by about half, from eight million to four million square kilometers (3.1 million to 1.55 million square miles). This has exposed an expanse of water more than 10 times the size of Germany, or somewhat larger than India. Satellite images reveal that this is another record year. 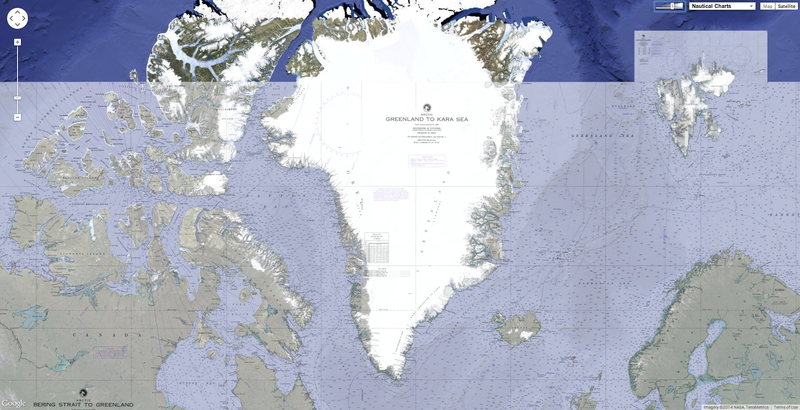 The Northwest Passage has been ice-free since early August for the second year in a row. And there is practically no pack ice left in the Northeast Passage, north of the Siberian coast. This is unprecedented in recent history. Temperatures are rising in the North Atlantic, and the permafrost soil in Siberia, Canada and Alaska is softening. According to the Intergovernmental Panel on Climate Change (IPCC), the Arctic is subject to "stronger and faster warming than any other region." Arctic animal and plant species must adjust to far more extreme changes than elsewhere -- or face the threat of extinction. It is not surprising that the polar bear has become a symbol of climate change. People also live in the Arctic region. The Inuit are the ancestral settlers of the north. They number about 100,000 and are scattered across Alaska, Canada, Greenland and Siberia. Their familiar habitat is sinking as the permafrost soil softens. Some stand to benefit from the end of the ice era. As the wheat farming zone shifts farther to the north in Siberia, the Russians are looking forward to rich harvests. Farmers in Greenland recently began growing potatoes and broccoli, making the territory less dependant on shipments from the south. US aluminum producer Alcoa plans to build a huge aluminum smelter near Greenland's capital city, Nuuk. Hydroelectric power from melting glaciers will provide the electricity for the plant. As the ice melts, previously impassable shipping routes become navigable. Large amounts of money and effort are already being poured into expanding ports like Murmansk, Churchill and Hammerfest. Most of all, the Arctic is releasing unimagined amounts of resources, especially oil and gas, but also various ores. National covetousness and unclear rights of ownership could even lead to a cold war in the Arctic Ocean. Although the foreign ministers of the five Arctic nations came to a diplomatically worded agreement this spring to further strengthen "cooperation in the Arctic Ocean," this certainly does not stop these countries from embarking on a massive military buildup in the region. Canada, for example, is adding 1,000 additional soldiers to its Arctic Ranger troops, investing more than $3 billion (€2.1 billion) in new Arctic patrol ships and building a new naval station at Nanisivik for $100 million (€70 million). "The first principle of Arctic sovereignty is: Use it or lose it," Prime Minister Stephen Harper said when he announced plans to expand Canadian territorial waters by a half-million square kilometers (193,000 square miles) at the end of last month. 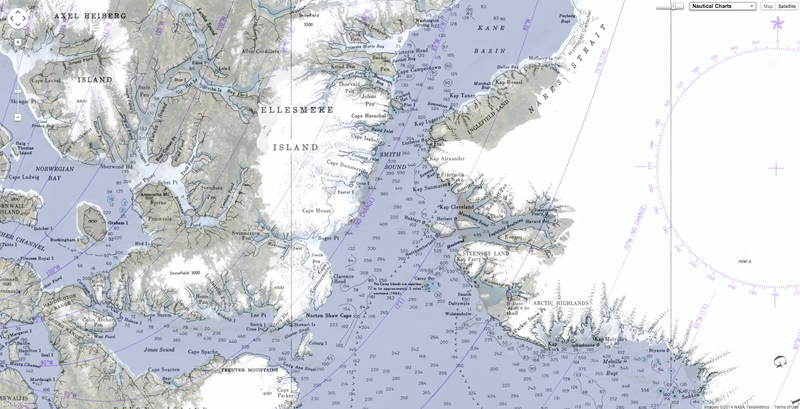 The United States, for its part, is currently surveying the ocean floor north of Alaska. Following in the footsteps of the Russians, the United States hopes to assert extensive territorial claims in the region before the United Nations. Part of Washington's plans include spending an estimated $1.5 billion (€1.05 billion) on new ice-breakers, as Michael Chertoff, the head of the powerful Department of Homeland Security, said recently when he visited Alaska with Admiral Thad Allen, commandant of the US Coast Guard. "All I know is there's open water where there didn't used to be, and I'm responsible for it," the admiral said in a booming voice. In a few weeks, the White House plans to unveil a new political strategy for the Arctic, the first since the collapse of the Soviet Union in the early 1990s. There are smoldering territorial conflicts between Denmark and Canada, and between Russia and Norway. Energized by visions of mineral resources soon to be released from the grip of the ice, politicians, too, are discovering polar research. Millions upon millions of dollars are suddenly becoming available, as the Arctic experiences, in this year's International Polar Year, an onslaught of climate researchers, ecologists and geologists. The governments have an ulterior motive, hoping that science will help back up their territorial claims. Denmark is spending close to €340 million ($486 million) on polar research. From the pragmatists' standpoint, the Arctic Ocean is opening up at just the right time. Exploding prices are fueling an onslaught on the riches of the North. The British-Dutch energy conglomerate Shell, for example, spent a record sum of $2 billion (€1.4 billion) for licenses in the Chukchi Sea north of the Bering Strait. Energy multinational BP recently spent $1 billion (€700 million) for oil exploration rights in the pack ice in Canada's Mackenzie River estuary region. A $16.2 billion (€11.3 billion) pipeline will connect the new energy-producing region with areas to the south. The Danish company DONG Energy A/S began collecting seismic data in Disko Bay on the west coast of Greenland. A forecast issued by the US Geological Survey (USGS) in July has ignited both fascination and greed. For the first time, the agency provided a detailed estimate of the Arctic region's oil and gas potential. The USGS concludes that the region north of the Arctic Circle holds the equivalent of 412 billion barrels of oil, or close to one-quarter of the world's undiscovered but technically reachable oil and gas reserves. This is significantly more than proven reserves in Saudi Arabia. The true dawning of the Arctic boom has only been made possible by satellite navigation and nuclear-powered icebreakers -- and climate change. By accelerating global warming, the wasteful burning of oil and gas is causing the ice in the North to melt, thereby clearing the way to the Arctic, where, ironically enough, gigantic oil and gas reserves lie waiting to be exploited. Geologists, resource hunters, zoologists and the military -- all are taking advantage of the brief polar summer to deprive the last wilderness of its secrets. Geir Richardsen, 47, will probably never get used to the cumbersome procedure involved in squeezing himself into his protective gear. He forces the uncooperative neoprene over his head, pulls it over his hands and smiles in amusement at how odd they look, sheathed in plastic. But Richardsen, a geophysicist working for the Norwegian energy conglomerate StatoilHydro, knows perfectly well that his helicopter is flying over water where the temperature is barely above freezing. "Without the suit, you would freeze to death in minutes." Richardsen normally wears a pinstriped suit to work, in an air-conditioned office with carefully trimmed indoor plants. But when this workweek begins, he will be standing in a filthy mix of mud, oil and viscous drilling fluid. "There is something to celebrate," the Norwegian says. His helicopter makes one last victory lap around the drilling platform before touching down safely on the landing pad. The steel monstrosity stands in the Barents Sea, almost halfway between the North Cape and the Norwegian island of Spitsbergen. "But that will change," says Richardsen. The name "Polar Pioneer" is more than appropriate. The drilling platform is currently the northernmost operating platform of its type. The horrendous costs (hundreds of thousands for a single day of drilling) seem to be paying off. The rotary head struck gas three days ago -- the reason for Richardsen's visit. For majority state-owned StatoilHydro, the new gas field, dubbed Ververis, is a test zone for the further exploration of Arctic energy resources. "In my student days, if anyone had told me to drill for gas up here," says Richardsen, "I would have laughed out loud." Too cold, too dangerous, too expensive -- that was every expert's assessment at the time. In Canada and the United States, lawsuits initially stood in the way of exploratory drilling off the Arctic coast. Norway, on the other hand, proved to be more intrepid. "We want to be the leaders in developing the Arctic reserves," says Richardsen, who heads StatoilHydro's oil and gas exploration efforts north of the Arctic Circle. Workers, their red protective suits covered with a pervasive layer of grime, balance the suspended metal parts. The rods come crashing down onto the corrugated metal floor of the platform, spewing sludge extracted from the depths. Everything moves in keeping with the choreography of chief driller Egil Slåtbråten, who sits at a joystick in a Plexiglas cockpit. Slåtbråten's job became complicated the day the drill reached the gas deposit. Suddenly everything had to move quickly. "Raise the counterpressure so the gas doesn't shoot up into the well," says Slåtbråten, the folds of skin on his neck tightening with the strain. The methane was under 395 bar of pressure. But the geologists wanted all kinds of samples, which meant that Slåtbråten had to drill laterally into the layer of rock that contained the gas, and then seal off the hole. "It's a completely sealed system," says Terje Svendsen, explaining that this is why it is so pleasantly warm on the work deck. Svendsen is a deck hand, which makes him responsible for everything that happens on the deck of the platform. He takes Richardsen on a tour of the "Polar Pioneer," out of its protective shell and down to the last level above the surface of the water. At this level, it is possible to see the drill pipe as it disappears into the swells. Deep below, at a depth of 2,926 meters (9,597 feet), the metal is eating its way through rock. "A nice summer's day," says Svendsen, as Richardsen turns up his collar. When the feared polar low-pressure systems come roaring in, the spray slaps against the men's faces and freezes immediately onto metal parts. "We break off the ice with axes," says the 50-year-old deck hand. But even Svendsen's good spirits have their limits. "You know," he says to Richardsen, "there's a reason I have a vacation house in Thailand." The area covered by Arctic sea ice has been shrinking for many years, offering access to untapped oil and gas deposits during the summer months in future. It could also open up new shipping routes, such as the Northwest Passage and Northern Sea Route, which are much shorter than the Panama and Suez Canal routes. Meanwhile, at StatoilHydro's research and development laboratory in the central Norwegian city of Trondheim, engineers are developing new technologies for dealing with the harsh Arctic environment. In the first producing gas field in the Barents Sea, known as Snøhvit (snow white) StatoilHydro, without further ado, placed the entire production unit on the ocean floor so that icebergs can simply drift across the system. StatoilHydro plans to have its Arctic oil and gas production running at full speed by 2030. "We're currently taking giant steps up a technology ladder," Richardsen says proudly. But what happens to production in the midst of a polar low-pressure system? When it comes to toughing it out in the polar regions, the descendants of explorer Roald Amundsen -- the first person to reach both the North and South Poles -- are not about to be upstaged. But politics are a different story altogether. Norway, a country of 4.7 million people, shares the Barents Sea with Russia, and a 155,000-square kilometer (60,000-square mile) section is considered disputed. Another dispute, over Spitsbergen and its status under international law, has been smoldering since 1920. The Russian Defense Ministry provoked Norway when it sent the warship "Severomorsk" to cruise the waters off Spitsbergen this summer. Two days later, the Russian air force conducted firing exercises over the Barents Sea with Tu-22M3 supersonic bombers. It was all part of a series of previously arranged exercises. But Russian military leaders later said, with the poker faces and rhetoric of the powerful, that they had "reestablished a military presence in the Arctic." The fronts in the new Cold War are still drawn between the old blocs, and the theaters are the same, but exactly where these fronts are located remains unclear. Karsten Piepjohn hasn't shaved in four weeks, and the hairs of his beard are beginning to curl around his mouth. He isn't the only one sporting the wilderness-chic look. It is only 8 p.m., but Piepjohn and his fellow researchers from the Federal Institute for Geosciences and Natural Resources (BGR), based in the northern German city of Hanover, are exhausted as they sit on benches around a table. A wind from the north, from the sea, is tugging at the lines of the main tent. The team's camp is less than 900 kilometers (560 miles) from the North Pole. "The Russians have flushed out half the world," says Piepjohn -- his own team's backers from the German Economics Ministry included. 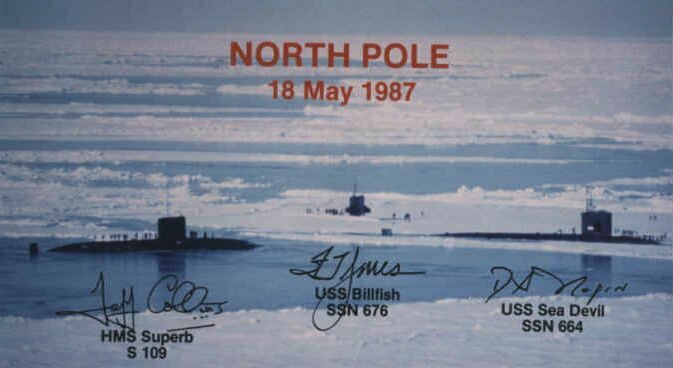 Piepjohn, a geologist, is referring to the spectacular actions of an eccentric Russian member of parliament, who traveled to the North Pole by submarine last year and had a Russian flag driven into the seabed there -- a meaningless act of appropriation under international law. Years ago, who would have been interested in discovering what happened to this glaciated island, part of the Canadian Arctic today, 100 million years ago? "We may be looking back to the Paleozoic age," says Piepjohn, "but what we discover in the process is critical to the policies of today." Suddenly scientists are no longer interested in basic research alone. Instead, they are shifting their attention to mineral resources -- and everything hinges on the question of who just owns the North Pole. The reason this is so important lies in a complex provision of the United Nations Convention on the Law of the Sea, which states that the territorial claims of each member state extend beyond the 200 nautical-mile zone if the country has proven that its own continental shelf protrudes beyond this zone. 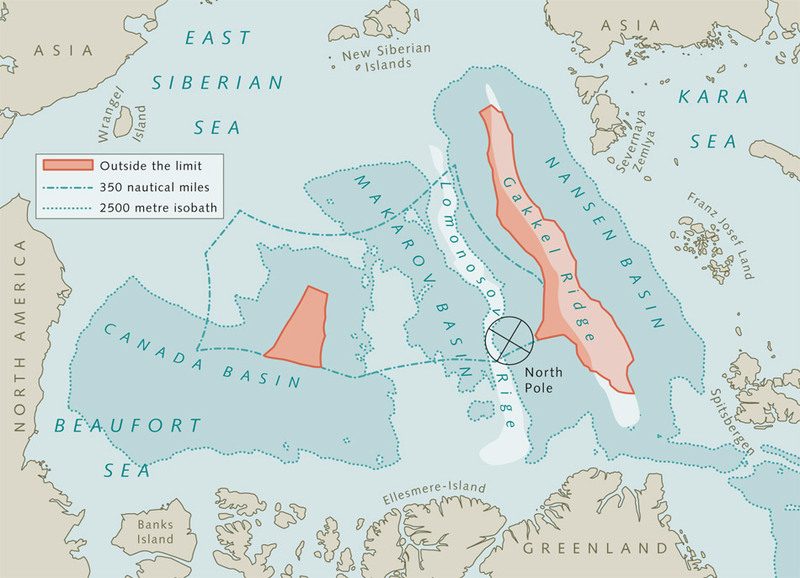 Prolongation of the continental shelf in the Arctic. The Gakkel Ridge is shown in red on the right. The area marked in red on the left cannot be claimed by any littoral state as it is circumscribed by the 2500 metre sobath. The Lomonosov Ridge lies to the left of the Gakkel Ridge between two 2500 metre isobaths. Each nation must submit its scientifically supported claims to a United Nations body with the odd name UNCLOS. The Russians took the most cavalier approach to the task, by simply selecting the two longest mountain chains in the northern Arctic Ocean -- the Lomonossov Ridge and the Alpha Ridge -- and declaring them part of their continental shelf. In doing so, they hoped to quickly lay claim to an enormous Arctic region covering more than 1.2 million square kilometers (463,000 square miles). But anyone who hopes to truly grasp the current geology of the Arctic must embark on a journey into the past. On the next morning, Piepjohn and his crew board their helicopter to take precisely such a trip. The BGR geologists are reconstructing the formation of the Arctic, and the key to that lies in a time long ago, when palm trees rustled in the wind here. It was about 400 million years ago, and a large, open sea did not exist in the region. Instead, as Piepjohn assumes, the area was the site of a gigantic collision. The original continents, Baltica and Laurentia, collided "exactly here, on Ellesmere," says Piepjohn, clapping his hands together and laughing. "What we're looking for now is the compression zone." The traces of this continental collision are still visible from the helicopter. "Look, over there, a fold!" says Andreas Läufer, 43. With a wave of his hand, the geologist indicates to the pilot that he should allow the helicopter to hover over the ridge. The layers of rock are shaped as if God had been practicing origami. Läufer reads the formations the way others would read a history book. "Spitsbergen, this northernmost bit of the European continent, is an excellent geological match for this rock that we find today on the other side of the North Pole," explains Werner von Gosen, a geology professor from the southern German city of Erlangen. After the great collision, the two continents Baltica and Laurentia became wedged together and then drifted apart again. That, says Gosen, is how the northern Arctic Ocean was formed. The details of this powerful continental drift have sweeping consequences. "In the warm, prehistoric past of the Arctic, large reserves of oil and gas were formed," says Piepjohn. The sixty-four-thousand-dollar question is: Where are they today? "Geologists have already found oil in the southern part of Ellesmere," says the BGR geologist. But if Ellesmere and Siberia, separated by the northern Arctic Ocean today, were still connected when these fossil fuel reserves were created, there would have to be large undiscovered reserves off Russia's northern coast today. The discoveries by the BGR team could also have important consequences for the drawing of territorial borders in the Arctic. If the theory Piepjohn and his team are proposing, namely that Laurentia, the precursor to the North American continent, and Eurasian Baltica were one long ago, it could mean that the underwater Lomonossov Ridge is attached to both the Siberian and the Canadian continental shelf -- just off the coast of Ellesmere. In that case, the maritime border between Canada and Russia would have to be drawn exactly in the middle of the long undersea ridge, creating a stalemate situation. One of the curiosities of this vast continental puzzle is that when today's northern Eurasia and the original American continent split apart about 60 million years ago, a fragment of Europe remained attached to the northern part of Ellesmere. "That's why we are in fact standing on European soil," Piepjohn says facetiously, and quickly adds: "Geologically speaking, of course!" The powers that be arrive here in the form of a man wearing freshly polished, black leather shoes. Commanding Officer Marc Rothwell, captain of the "Louis S. St-Laurent," a Canadian Coast Guard icebreaker, orders his crew to drop anchor in the sea ice near Cornwallis Island. He climbs onto the bridge. Rothwell has been sailing the seas for 28 years, most of that time in the Arctic. His job is to "show Canada's colors" in the North. Several year ago, Rothwell's ship was one of the few capable of digging its way through the pack ice to bring supplies to the few scattered settlements in the Canadian Arctic. But today shipping traffic has grown dramatically, and it will continue to do so. Rothwell monitors a shipping lane that is expected to compete with the Panama Canal in a few years: the legendary Northwest Passage, which weaves its way through the archipelagos of the Canadian Arctic and shortens the nautical distance between New York and Shanghai by more than 4,000 kilometers (2,485 miles). The first man to sail through the Passage, in 1906, was Norwegian explorer Roald Amundsen. "Back then he had to spend two winters en route," says the captain. Today, Rothwell expects to slip through the narrow, frosty passageway in less than a week. He bends over and carefully studies a satellite map the Canadian Ice Service radioed to him. Rothwell knows that his most important ally is the summer sun, which has melted large puddles into the white surface all around his ship. "The water surfaces absorb significantly more heat," says Rothwell, "and the ice melts away quickly." 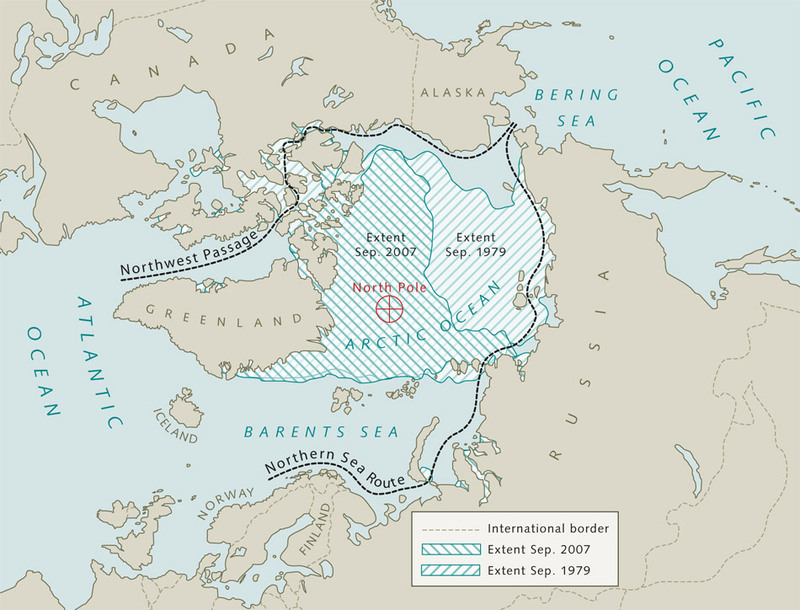 In the past, a powerful ocean current pushed large amounts of ice from the Beaufort Sea in the west into the Northwest Passage, creating insurmountable barriers. But ice production is on the decline. "The ice has never receded as far north as it has in the last two years," says Rothwell. A critical point appears to have been crossed long ago, a point that could mark the end of the constant ice cap in the northern Arctic Ocean. Once the perennial ice melts, the water will heat up to a point at which a layer of ice thick enough to survive the summer can no longer develop. "I am both fascinated and horrified to be able to observe such a epochal change within my professional life," says Rothwell. The dispute of the Northwest Passage is already in full swing. Canada claims unlimited territorial control by its own navy, while the Americans see the Passage as an international sea lane open to all. David Wilkins, the US ambassador in the Canadian capital Ottawa, puts it this way: "Sea lanes like this one should be for the passage of ships. International trade demands this." But the real reason could also be military, because if Wilkins is right it would mean that submarines would be permitted to side through the international sea lane while submerged. "I'd rather stay out of it," says Captain Rothwell, before putting in his own two cents. "Even if the ice recedes, it will never disappear completely," he says. 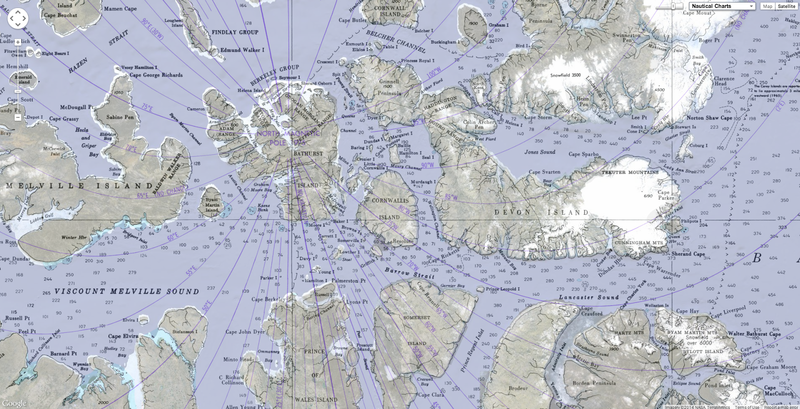 This, he says, can only mean that Canada's strict environmental regulations for ships traveling in the Arctic must also apply if the Northwest Passage becomes a high-volume shipping lane. "Up here, the consequences of an oil spill are far worse than somewhere in the Caribbean or in the open Atlantic." Rothwell imagines horror scenarios of container ships crushed by ice floes, oil spills trapped beneath the ice and wreckage remaining virtually invisible in the winter-long darkness of a polar night. Until recently, fantasies like this were just that -- a nightmare with no basis in reality. But that could change. In 2005, 3 million tons of freight crossed the Arctic on ship. That number is expected to increase to 14 million by 2015. Shipping analysts even expect the region to eventually handle one percent of global maritime trade, or about 77 million tons. Rothwell hopes that the Canadian north will no longer be seen as his country's worthless "back door." He also hopes that the new icebreakers the government has promised will be delivered quickly. "Things have to settled quickly here," he says. The ice of the Arctic forges many friendships, even unusual ones. One of them is between Olivier Gilg, an ecologist, and Jan Almqvist, a businessman. The two men are sitting in the midnight sun, in front of a green barracks building at Station Nord, Denmark's northernmost military station in Greenland. Almqvist is, in a sense, the manager of the northward movement. He is the general manager of an icebreaking company called POLOG ("Breaking the Ice For Your Operation!"). Business has always been good, says Almqvist, "but this year we have almost more work than we can handle." In the past, Almqvist's work was limited to researchers like Gilg, whom he helped with the logistics for his animal studies. But today more and more of POLOG's customers are geologists and pioneers working for the oil and gas companies. Almqvist organizes everything: aircraft and helicopters, quarters, tents and polar sleeping bags. He also has the necessary food brought in. Together, they served for four years in the Danish military. Their mission -- a unit of 12 men -- was to secure a border almost 5,000 kilometers (3,105 miles) long. Almqvist was a member of the Sirius Patrol, the legendary unit that monitors the northern and eastern coast of the enormous island with huskies and dogsleds. Built as a joint effort by Danes and Americans in 1953, for many years Station Nord served as an emergency landing strip for the Americans' nuclear bombers. The camp belonging to the Australian exploration company Ironbark Gold, Almqvist's best customer, is an hour's plane ride away, on Lemon Fjord. It is the last speck of land before the North Pole. A dozen geologists and drilling experts are currently living there in tents. "I'll have investors flown up there next week," says Almqvist. They're interested in building a zinc mine. Projects like this are visions of horror for ecologist Gilg -- bulldozers plowing through Arctic poppies, crushing delicate mosses and lichen. "The lichens take decades to grow a few millimeters in this cold, dry world," says Gilg, a Frenchman. The responsibility for administering the region has shifted from the Environment Ministry in Copenhagen to the Greenlandic administration in Nuuk. The government there, says Gilg, wants independence from the Danish motherland. "Millions in mining revenues are exactly what they want," Gilg complains. Gilg is staying at Station Nord with his wife and their five-year-old son, Vladimir. The couple, together with Swiss ornithologist Adrian Aebischer, are studying the complex relationships among the few species of Arctic land animals. Last year, the Gilgs observed polar bears on the Henrik Krøyer Holme Islands in northeast Greenland. Every summer, the predators come to the islands in search of their favorite prey. "Seals cavort there on the beaches and on the sea ice," Gilg explains. The Inuit of northwest Greenland call the polar bears "great wanderers," and science has proven them right. A female tagged on Spitsbergen turned up in the town of Nanortalik in southern Greenland -- 3,200 kilometers (1,987 miles) -- a year later. Scientists are divided over how threatened polar bears really are. This May, after a prolonged controversy, the United States added the polar bear to its list of endangered species. Seven of the populations being studied are either growing or stable, while five are shrinking. While a dramatic decline is predicted, it is not expected to happen until sometime in the future. "The polar bear is more capable of surviving for two to three months with reduced sea ice than other animals," says Gilg. An example of a species that is truly endangered, however, is the ivory gull. After Gilg has put his son to bed, the animal researchers spend yet another sunny polar night on the lookout. They have set out nets for ivory gulls baited with the foul-smelling flesh of a young seal that died a few days ago near the airstrip. Now their job is to wait until their subject turns up. The resilient birds, with their bright white feathers, are like an early warning system for change in the Arctic. "Scientifically more interesting than the polar bear," says Gilg. According to Gilg, changes are clearly visible in the ivory gull. "It eats the carcasses of seals and fish on the sea ice," Gilg explains. If the sea ice disappears, the gull will be forced to leave. There were still 25,000 pairs living in the Arctic in the early 1980s. Today they have all but disappeared on Spitsbergen and in southern Greenland. Even Arctic manager Almqvist is there to watch the bird peck at Adrian Aebischer's hands with its sharp beak. "It's a young animal," he says, after counting the wing feathers. A satellite transmitter is attached to the screeching bird's back. Then Gilg uses a cotton swab to remove a saliva sample from the beak. "We analyze the genetic material," he explains. "It allows us to estimate the size of the current population." The ecologists are not optimistic. The melting ice is forcing the ivory gull to retreat farther and farther to the north. "And at the end of Greenland, they run out of places to go," says the Frenchman as he releases the white bird and watches it fly off into the deep blue sky. Saroomie Manik is the mayor of the small community of Resolute on Cornwallis Island. The hamlet's name comes from a sailing ship with the same name that was stranded there 155 years ago. But it could just as well describe the character of this petite, wiry woman. Like Manik, most of the residents of Resolute are Inuit. "The ice has become thinner," says the mayor. The Inuit go hunting earlier every year. "Otherwise our snowmobiles would break through the ice," says Manik. Manik, who is almost 60, still hunts. She shot her last polar bear two years ago. "I cut him open on the spot and loaded him onto the sled," she says, emitting a staccato-like laugh. Among the Inuit, it is primarily the women who are trying to preserve as much as possible of their original way of life. The experiences they have had in one or two generations are the equivalent of a free fall from the Stone Age into the Modern Age. "I still know how to use our traditional ovens," Manik says proudly. The Inuit burned blubber in the ovens, which kept them warm in their igloos during bitter-cold polar nights. All my kids know about is the microwave," she adds. Climate and cultural change are distorting the coordinates of Inuit life, which once followed the rhythms of nature: the reproductive cycles of seals and whales, light and darkness, ice and the open sea. The plight of the Inuit is tragic. In 2005, the Canadian government granted them sovereign rights over the regions they had traditionally settled, and their officials in Greenland are pushing for autonomy. The mineral wealth beneath their homeland could make them rich. But so far this new world has been more of a curse for them than anything else. Manik, a mother of five sons and two daughters, knows the seductive powers of this invasive culture all too well: the sweet candy bars, the spongy white bread and, most of all, the alcohol. Obesity is widespread among the original inhabitants of the Arctic, and the suicide rate is extremely high. And now they are faced with climate change. Manik wants to save as much as possible of her traditional roots. Keeping her head held high, she leads a group of young Inuit girls as they spin around the room, dancing a traditional dance in their blue-and-white embroidered costumes. They sing the peculiar guttural songs with which Inuit women once beguiled their men -- before they began watching TV. After the performance, Manik says: "When you white people think about nature, the first thing you want to do is change it!" She says she doesn't understand how it all works with the emissions, the ones that are supposedly heating up the planet's atmosphere. But she does know one thing: The people from the south, who have come here with their destructive ways, have a sinister power. "Maybe you can't imagine it," she says, "but we consider the polar bear part of the family."